Be sure to order early for the Advent Season! 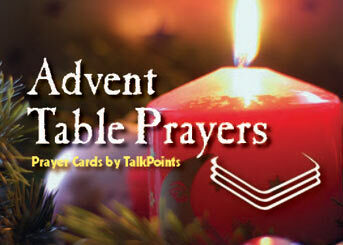 The front of each card is a table prayer based on an Advent theme. Choose a different card for each of the days of Advent. The back of the card continues the theme with a Bible verse and table topic. Just as food nourishes our bodies, prayer and God’s Word nourishes our souls. The deck has 32 prayer cards (2″ x 3″) and comes in a clear plastic box. $4.95 per set of cards. If you would like to make Prayer Cards available to your parishioners, you may order the quantity you hope to sell. TalkPoints will bill you for the total amount of your order including shipping. After 60 days, return any unsold boxes and send a check for the rest. If interested, please contact Consignment Sales at talkpoints@aol.com. The brevity and concise cards are great for a busy family on the go, rather than the long paragraphs of a daily devotional book. I love them! We will continue to use them everyday. We pray before supper every night. This added a new flavor. We like fresh prayers, the topics for discussion, and our children enjoyed reading the prayers. They were well received. They are fun to shuffle and pick or pick based on what our day has been like. The family loves the way the discussion topics get us off and running on our dinner conversation. The kids will now not even ask to start eating until we have all sat down and done a card. Nice mixture of prayers, scriptures and conversation starters. Kids made sure we didn’t miss doing them at dinner. We tend to skip over or quickly say “grace” before each meal. These cards gave us time to be thankful and thoughtful. We had been sharing daily “highs” and “lows” at our family meals. It was fun to hear each other’s answers to topics about challenges, regrets, something we were proud of, etc. My 6 and 7 year olds fought over who got to choose the card for the dinner grace. They like the new graces although we always had to start with one of our family’s traditional graces. They looked forward to hearing the “topic” for the day. Each person was able to participate at their age level. It helped us remember to take turns and that everyone had something of value to share. It took about three days and then we fell into a routine of using the Prayer Cards. We set them in the middle of the table so they would not be missed. It got me back to when I was young and talking at the dinner table. We all really enjoyed the blessings and table topic. All of it was very received by the whole family. These came to us at a perfect time. I had just placed a reminder to myself on the refrigerator to say our prayers at mealtime. We really enjoyed them! They are wonderful resource for family devotions and discussions at mealtimes. It was great to have a variety of prayers at mealtimes, but we especially appreciated the discussion starters. They helped to give shape to some very interesting family conversations. I like the idea of prayer cards and wish I had had them when my children were young. Our kids liked drawing a card and being the one to lead the prayer. Our kids really liked the cards. They liked having their turn to read the prayer at dinner. We immediately liked the colorful cards. Our 15 year old chooses the card for the meal. We all liked them. We had previously said a simple prayer as a grace, but as the kids have gotten older, we have wanted something with more substance. We like the different prayers and the discussion points. We like the ritual, traditional aspect. It was fun to pick a card. We took turns. We like the suggestions for topics of conversation. I think these would be great gifts, especially housewarming, wedding, new baby. The photography was beautifully done. This meets a need. Children enjoyed picking one out. My child who likes to sing enjoys the ones set to music. Like the food graphics. Like the table topics. Like the plastic box – it will last longer. We really liked the cards a lot. I believe once you receive them, you can’t wait to share them with someone else. I think they would make a fabulous gift for anyone and also a great fundraiser for the church. This from a postcard: I’ve already used the Table Blessings with my family – some have asked how to get them which gave me the idea of buying enough to give as Christmas gifts. I could use about 20-25. When will you have them for sale?